The skyline of Los Angeles is seen in this undated file photo. 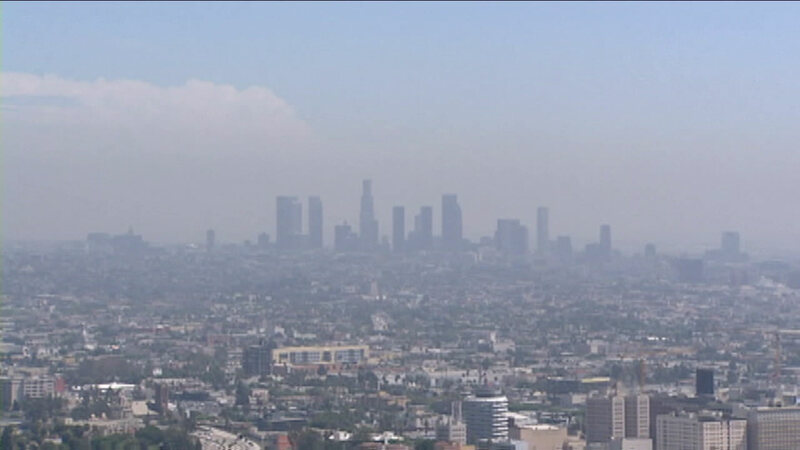 LOS ANGELES (KABC) -- More than 1,300 people in the Los Angeles area die every year as a direct result of bad air quality, according to a new report. The analysis by scientists at New York University and the American Thoracic Society (ATS) estimates there are 1,341 avoidable deaths from pollution yearly in the Los Angeles metro area and 800 in the Riverside-San Bernardino area. Ranking below California, the three states with the next highest impacts are Pennsylvania, Texas and Ohio, according to the report. Researchers believe Southern California would benefit more than any other region in the nation from reducing ozone and fine particle pollution below the level recommended by ATS, the report stated. Nationwide, the number of deaths attributable to pollution greater than ATS recommendations are approximately 9,321. The report puts that figure into perspective by indicating that there were 10,076 alcohol-related traffic deaths in the U.S. in 2013. The population level and number of cars are obvious reasons for pollution. But our now year-old fire season is also contributing to the bad air quality. The U.S. Environmental Protection Agency's health standard for ozone pollution is currently .070 parts per million. ATS recommends a more stringent level of .060 parts per million, saying the seemingly small change would substantially lessen the number of avoidable deaths. The "Health of the Air" report was published in the Annals of the American Thoracic Society. You can check if your area meets the EPA air quality standards by entering the city name or zip code at www.healthoftheair.org.